​Hailing from the US, Toni has been treading the boards since second grade, when she played “The Poor Beggar Woman” (alas, the show title has been forgotten, but the performance lives on!). A critically acclaimed and award winning Actor, Director and dialect coach, her credits include The Crucible, Oklahoma, Fiddler on the Roof, Cat on a Hot Tin Roof, Still Life, Veronica’s Room, Home Fires, Enchanted April, Laundry and Bourbon, and Lone Star. Toni toured the east coast of the US for many years as the "Lovely Miss Rosie Pink" with Doc Scantlin and his Imperial Palms Orchestra. In her other lives, she is an ordained Metaphysical Minister, a healer, and an English teacher. Toni is thrilled to join The Gate and looks forward to a long and productive relationship. Rick Pokrajen-Harmon is delighted to be directing The Gate Theater Group's 10th Anniversary Season opener, Deathtrap. Rick studied under Philip Sneed and Sands Hall at the Foothill Theatre Company and the Lake Tahoe Shakespeare Festival. He has previously directed his original adaptation of Come Back to the Five and Dime, Jimmy Dean, Jimmy Dean; Jacques Brel is Alive and Well and Living in Paris, Fiddler on the Roof and Oleanna. Acting credits include Buddy Plummer in Follies, Kokol in Marat/Sade, Captain Tench/Sideway in Our Country's Good, Max in Bent, Kerry Max Cook in The Exonerated and Alfie Doolittle in My Fair Lady. Rick is a pilot, sky diver, caver and scuba diver. A self-confessed adrenaline junkie, he reports that "Opening up and becoming vulnerable in front of an audience is by far the scariest thing I do." He lives in San Sai with his beloved husband Afan. A long-time member of The Gate Advisory Board, Steve has lived over 10 years in Chiang Mai and he shared he is not going any place else, ever again! Steve was born in Chicago, working life in New York City – in and around show business. He first thought he would never get into showbiz, now he thinks he cannot get out of it. He is happy to be working with a very talented group – even if it is far far off- Broadway. Steve directed The Gate's production of I Hate Hamlet in December 2014. Having traveled half the world as a commercial photographer, Neville entered his stage career when he moved from his native country, England, to Amsterdam in 1978. He went on to be a voice-over artist, radio broadcaster and producer with Radio Netherlands, but remained loyal to the theater. He shared, “I am an actor who occasionally directs. 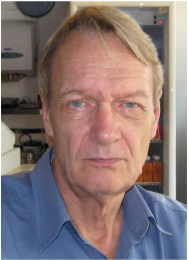 I was a founding member of Amsterdam Chamber Theatre (ACT) from 1990 to 2003." As an ensemble of international players, the members of ACT turned out many seasons of theater productions. While still in Amsterdam, Neville's last major play he directed was the comedy, Stags and Hens by Willy Russell.